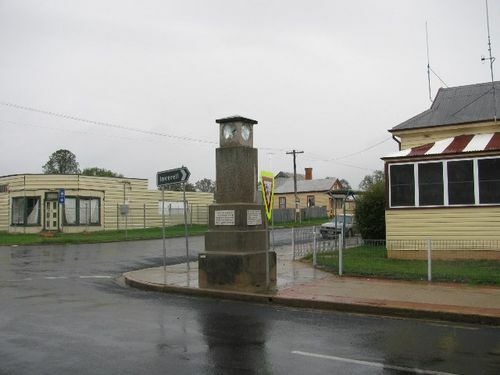 The clock commemorates 80 years of tin mining and 50 years of dredging in the Tingha district. Tin was first discovered in the Tingha District in 1871. A plaque on the memorial also commemorates the turning on of the electricity supply. Tingha was first settled in 1841 by Sydney Hudson Darby and became a mining town after tin was discovered there in the 1870s. Within a year Australia’s first commercial tin mines were operating at a private settlement known as Armidale Crossing. Over 6,000 people arrived and more than 25% of the miners were Chinese. By the early 1900s the mining boom was over and Tingha's population had dwindled to just a few hundred people. Shortly after this, large companies moved into the area to mine the less accessible tin. Back To Tingha Week, at which 80 years of mining and 50 years of dredging will be celebrated is to open on Sunday next when a number of bands from the district will compete in contests. The week's celebration will reach its climax on Saturday when several important events will take place. In the afternoon the town clock will be unveiled by Mr. Davis Hughes, M.L.A., and at night Cr. D.G.Mather, chairman of the North-West County Council, will switch on the electricity supply. Later in the evening Mr. D. H. Drummond, M.H.R., will crown the winner of the queen competition. Also the completion of the Tamworth - Tingha Electricity Project was unveiled on 23rd December 1950, by the Hon. Davis Hughes M.L.A.